Dongzhi festival (冬至) or the Winter Solstice celebration is one of the most important festivals for the Chinese and other East Asians. 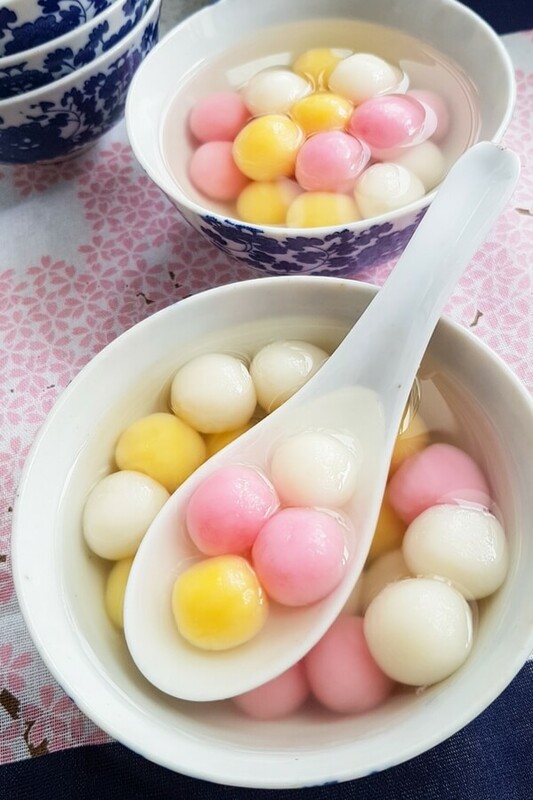 Traditionally, glutinous rice balls known as tang yuan (汤圆) is eaten on this day as the small, round dumplings symbolize reunion and harmony. They are also served during the Lantern Festival (元宵節 yuán xiāo jié) which is the 15th and the last day of the Chinese New Year. When I was small, I used to help my late mother and my aunties roll glutinous rice balls for Tang Chek (Hokkien for Winter Solstice festival) which falls around December 22 every year. Usually, my aunties would get pre-made colored dough from the wet market. In my native Hokkien dialect, we call the glutinous rice balls kuih ee. We sat around the dining table where the elders divided and rolled the colored dough into long strips. The strips of dough would then be pinched into smaller pieces and from there, I would start rolling them into little round balls. We used the white dough to make bigger tang yuan and the colored dough into small ones. This year, my kids helped me make tang yuan for the first time. Each child was assigned a different colored dough to work on. They had fun mixing the food coloring into the dough and rolling them into small balls (or funny shaped balls to be exact). “It’s like play dough!”, Piggy exclaimed as she kneaded and shaped the dough. It was good that they helped so I did not have to wash my hands after working on the different colored dough. After the tang yuan were cooked and eaten, they commented that they preferred tang yuan with filling. 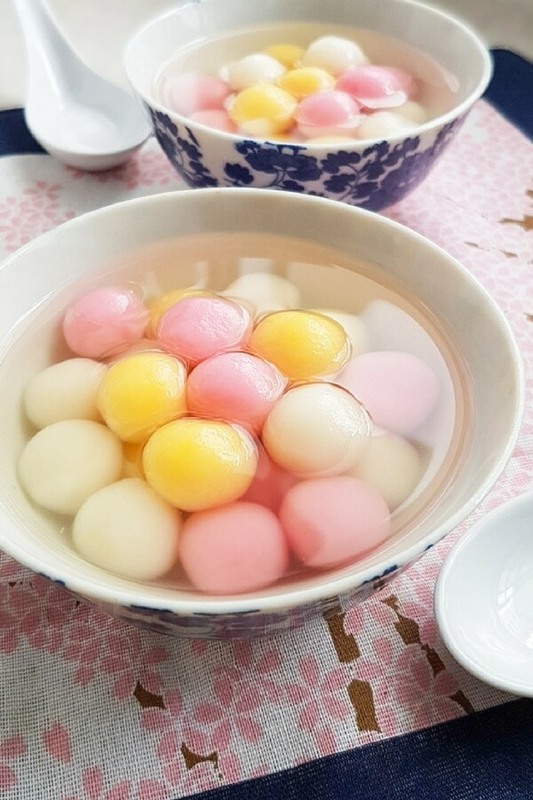 Indeed, although the tang yuan is smooth and pleasantly chewy, it is rather plain which is typical of the tang yuan eaten during Dongzhi. The taste comes from the ginger infused syrup so you have to eat the tang yuan with the syrup together. If you prefer filled tang yuan, try out this delicious tang yuan with runny peanut filling. Gradually mix water with the glutinous rice flour and knead till the dough is smooth and doesn’t stick to your hands. Tip: Remove the tang yuan immediately when they start to float up. Otherwise, they’ll become too soft and won’t be as nice. This dessert reminds me very much of my childhood days in Ipoh. As we all enjoyed making the tang yuan together, I’ve decided that from now on, it will be an annual affair as it is a fun family activity and good bonding time for us. More importantly, it is a tradition that I hope my children will carry on. If you like, you can also add these tang yuan into desserts such as a red bean soup. Prepare ginger syrup. Add water, ginger, sugar and pandan leaves into a pot. Bring to a boil and let simmer for 10 to 15 minutes. Taste the syrup and adjust as necessary. Set aside. 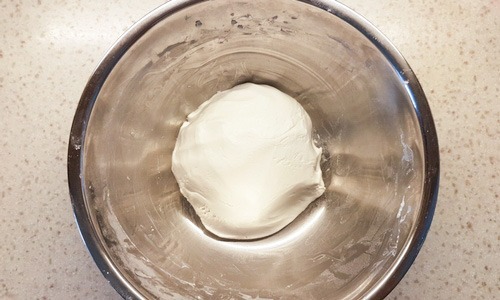 In a big bowl, mix glutinous rice flour with water and knead till it forms a smooth pliable dough. Divide the dough into three portions with the biggest portion white. Add about 3 drops of red food coloring to make one portion pink. Knead the dough until the color is evenly spread. Repeat this process with the yellow food coloring on the remaining portion. Roll the 3 portions into strips. Pinch each strip into small portions and roll them between your palms into round balls. Set aside on a parchment paper or slightly damp kitchen towel. Bring water to a boil in another pot. Slowly drop in the glutinous rice balls and cook till they float up. Ladle up with a spider spoon/sieve and transfer to a big bowl of water if not serving immediately. If you're serving right away, ladle them into individual bowls and pour the ginger syrup over them. If the dough is too dry, add some water and add some flour if it is too wet. Making Tang Yuan looks like a lot of fun for the family to do together. I love that you are continuing the tradition with your children and hopefully your children will continue the tradition. I love glutinous rice in any form, although I do prefer it in savory form most of the time. How long do they keep once you make them? This sounds fantastic and like a whole lot of family fun. So these little color full balls, do they kind of taste like dumplings or something else? I am also curious about this celebration, is the purpose just to have a fun celebration or is there a more significant meaning like to bring you luck or something of that nature? These tang yuan are unfilled so they are plain on their own. What I like about them is their slightly chewy and pleasantly gummy texture which is achieved by using glutinous rice flour. Do you mean the Lantern Festival or Dongzhi? It is a Chinese tradition to eat tang yuan for both these celebrations. 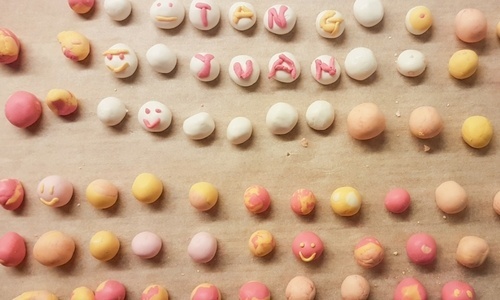 The name tang yuan sounds like tuányuán (团圆) so this food symbolizes family unity, reunion and togetherness.